On the 6th (Tue), contemplate the waterfront views at Yarab Tso Lake, appreciate the views at Nubra Valley, and then take in the pleasant sights at Hunder Sand Dunes. For reviews, other places to visit, maps, and tourist information, read Nubra Valley online trip itinerary builder . Pune to Nubra Valley is an approximately 11.5-hour flight. You can also drive. Finish your sightseeing early on the 6th (Tue) to allow enough time to travel to Lamayuru. On the 7th (Wed), contemplate in the serene atmosphere at Lamayuru Gompa. Before you visit Lamayuru, use our trip planner to discover what you can do and see there. You can drive from Nubra Valley to Lamayuru in 6.5 hours. You'll have a few hours on the 7th (Wed) to wrap things up before traveling to Alchi. On the 8th (Thu), contemplate in the serene atmosphere at Alchi Monastary. For more things to do, reviews, where to stay, and more tourist information, read Alchi trip planner . Traveling by car from Lamayuru to Alchi takes 1.5 hours. You'll have a few hours on the 8th (Thu) to wrap things up before traveling to Hemis. 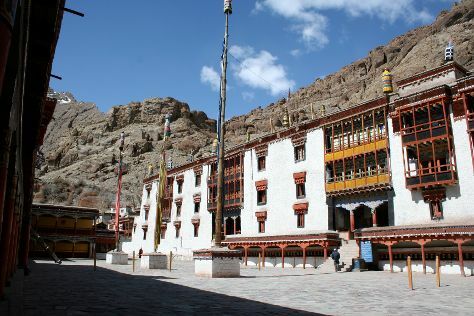 Start off your visit on the 9th (Fri): contemplate in the serene atmosphere at Hemis Monastery. To find other places to visit, traveler tips, where to stay, and more tourist information, use the Hemis trip itinerary maker website . Getting from Alchi to Hemis by car takes about 2.5 hours. You will have some time to spend on the 9th (Fri) before leaving for Leh. Get outdoors at River Rafting & Tubing and Donkey Sanctuary. Explore hidden gems such as Photography Tours and Spituk Monastery. Spend the 11th (Sun) among lush scenery at Zanskar the Virgin Valley. And it doesn't end there: contemplate in the serene atmosphere at Thiksey Monastery, make a trip to Confluence of the Indus and Zanskar Rivers, admire the landmark architecture of Stakna Monastery, and tour the pleasant surroundings at Markha Valley. To see ratings, where to stay, and tourist information, use the Leh trip planning website . Traveling by car from Hemis to Leh takes an hour. Finish your sightseeing early on the 14th (Wed) to allow enough time to travel back home.